I am using windows xp which was working fine till yesterday but today when I started my PC, it was not showing any DVD drive option. It is quite shocking as well for me because DVD is running inside the DVD drive. How can I solve this Issue? While opening DVD drive from windows 7 ultimate itÂ’s giving message DVD canÂ’t open? This problem occurs sometimes due to some minor change in the registry. So first of all try to Restart your windows and check whether your problem still persists or not. Make sure that your CD/DVD drive is working fine and is connected with proper cable. Now type “diskmgmt.msc” and press enter. 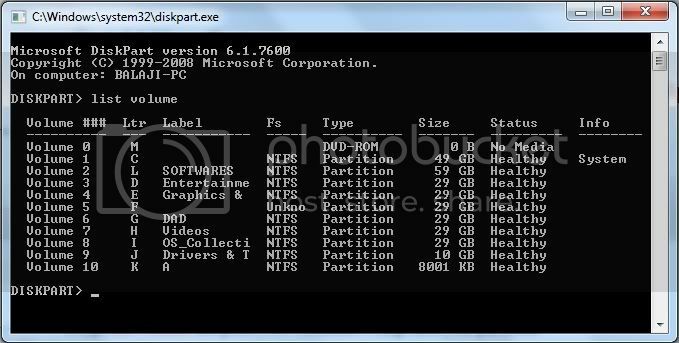 You will now see the names of all drives.select your cd/dvd drive there. Right click on the cd/dvd drive and click on “Change Drive Letter and Paths” and assign a new drive name to your cd/dvd drive. Now you would be able to see your CD/DVD drive without any issue.. If your Cd or DVD drives are not working properly then it might be due to the hard ware problem or might be due to the Loose connection of the Wires. so first check the cables attached to the DVD drives. The not functioning problem also may be due to the internal Problem in the DVD. it might be little changes may be in the registry of the Computer. another method is by using the Disk Management to change or to assign the new Drive. STEP 1: Click Start and Click Run. STEP 2: Type "diskmgmt.msc" and Press Enter. STEP 3: Verify whether the CD/DVD Device is assigned a name or not. STEP 4: If the Device does not have a name, then right click on it and Select "Change Drive Letters and Pths". STEP 5: Click "Add" and Click Assign the following Drive Letter and then Click the Drive Letter from the List. STEP 5: Click "OK" twice and the Close the Disk Management. Hope these tips will fix your problem. 3.In the navigation pane, locate and then click the following registry subkey. 4.In the right pane, click UpperFilters. 5.On the Edit menu, click Delete. 6.When you are prompted to confirm the deletion, click Yes. 7.In the right pane, click LowerFilters. 8.On the Edit menu, click Delete. 9.When you are prompted to confirm the deletion, click Yes. 1)In Windows XP, click Start , and right-click My Computer . 2)In Windows XP, select Properties , click the Hardware tab, and then click the Device Manager button. 3)Click the plus sign ( + ) next to DVD/CD-ROM Drives (or similar) category. If the CD or DVD drive name is missing , the drive is not being detected by Windows. Close Device Manager and skip to the section CD or DVD drive is not recognized by Windows . If a drive name is shown but is disabled (icon is marked with a red X), the drive has been disabled. Right-click the drive name and select Enable . You may have to restart the computer to complete the enabling process. The drive should work correctly once it has been enabled. If a drive name is shown but contains an alert icon (an icon marked with an alert symbol, ! ), then use the section Using Device Manager error codes to troubleshoot the problem. 3 It will list all the drives present in your computer. 3) Verify that the CD/DVD drive has power. For example, does the tray open so that you can insert a CD or DVD disc in the drive? a. Click Start, and then click Run. Or click Start Search. Your problem will be solved by these steps. It involves some experience in advanced features. So, please do these if you have any friend of you who is an advanced user. Don't worry even if you are not a geek, just take a backup of regisrty or create a restore point. * In the Open box, type regedit, and then click OK.
* In the right pane, click UpperFilters. * On the Edit menu, click Delete. * When you are prompted to confirm the deletion, click Yes. * In the right click pane, click LowerFilters. * Now Exit Registry Editor. You are done..!!! Best of Luck..!! 1. open the central processing unit(cpu). 2. unplug the CD/DVD cables and clean it. 3. reconnect the cables properly. 5. log into windows and check it. First Click Start and Click Run. then Type "diskmgmt.msc" and Press Enter. e Letter from the List. Step 2 Open the computer Management window in left side of this window Show the “Computer Management (Local)” option It has Three sub option. Step 3 clicks the first option “System Tools” show the full detail then click the last option “Device Manager”. Step 4 After click the “Device Manager” option Right side of “Computer Management” widow show the your Pc name. Step 5 Click your Pc name and go to DVD/CD-ROM drives and click it it show the your DVD/CD-ROM name. Step 6 Right click the your DVD/CD-ROM chose the enable option after show the message then press the Ok button.. Follow this steps show the DVD drive in your pc. Hello my friend..as shown above some members posted so many ways to fix your problem. However if you still not able to clear you issue i am showing you a video link from where you can easily understand how to solve your problem. and then there is a button on the right side i.e "Run now" and click on it. check for the connections of cable in the cpu cabinet if they are all tight ,in case they are loose just make them tight. But if the problem still continues then you will have to consult your technician for the replacement of the same. If your Windows Xp is not showing DVD drive option in the My Computer. Then, check the cable after opening CPU Cabinet. Check whether it is properly connected or not. Open your Computer again, even then if problem is not solved. Check your PC through nearby computer dealer. 1) Click Start and then click Run..
2) In the Open box, type regedit, and then click OK.
4)In the right pane, click UpperFilters. 10)Exit Registry Editor and restart your computer..